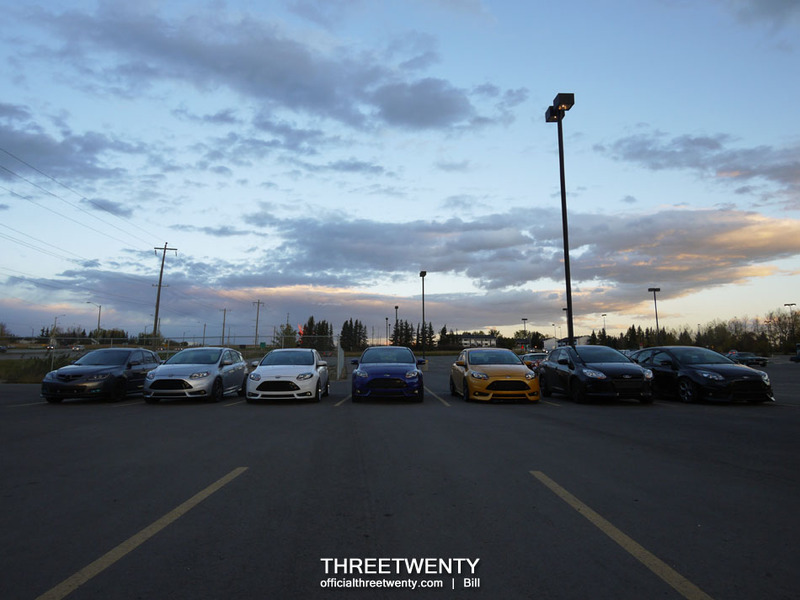 As mentioned in the announcement post for this meet, some local ST owners had been wanting to organize a Calgary meet and we opted to have it at Grey Eagle. 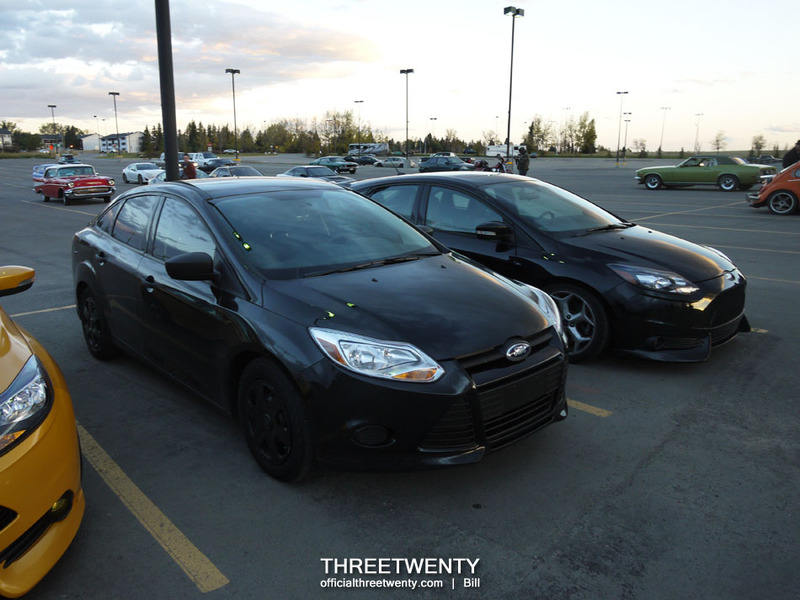 We weren’t sure exactly how many to expect but in the end we had 6 Foci and 7 Foci owners present (one unfortunately couldn’t bring his car) and got the chance to hang out for a little bit. Another goal of ours had been to get at least one ST in each colour together at the same time but we didn’t quite meet that. After some time at GE the weather happened to change faster than I think I have ever witnessed and we suddenly found ourselves freezing cold and in need of some shelter. After waiting for a little while for it to warm up again, and then realizing it wouldn’t, most of us headed over to A&W to find some food and warmth. There, we refueled with some burgers and chatted for a while before calling it a night and heading home. This was the group of cars once everyone had arrived. Even though it was during the normal Grey Eagle meet hours, look at how empty the lot was! Some may be wondering why there was a Mazda 3 (Yolanda’s, which has been seen here before) but the 3 can be considered the cousin of the Focus so it’s part of the family. The one Focus that I was really hoping would show up was this Silver ST on Varrstoens (Anthony’s). 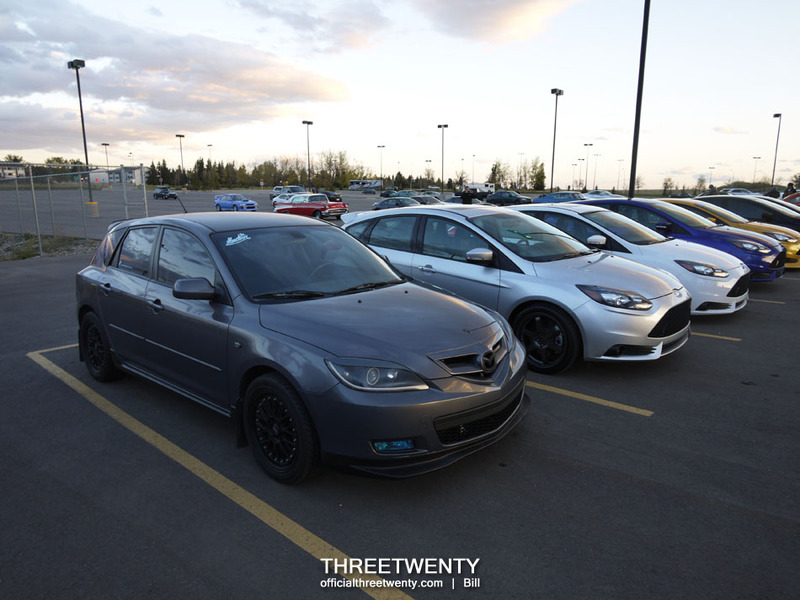 Silver is the rarest of all ST colours in Canada so it has been the hardest to track down for a meet. I’m not sure how many Canadian ’14s are in this colour but only 77 were sold here for the 2013 model year. 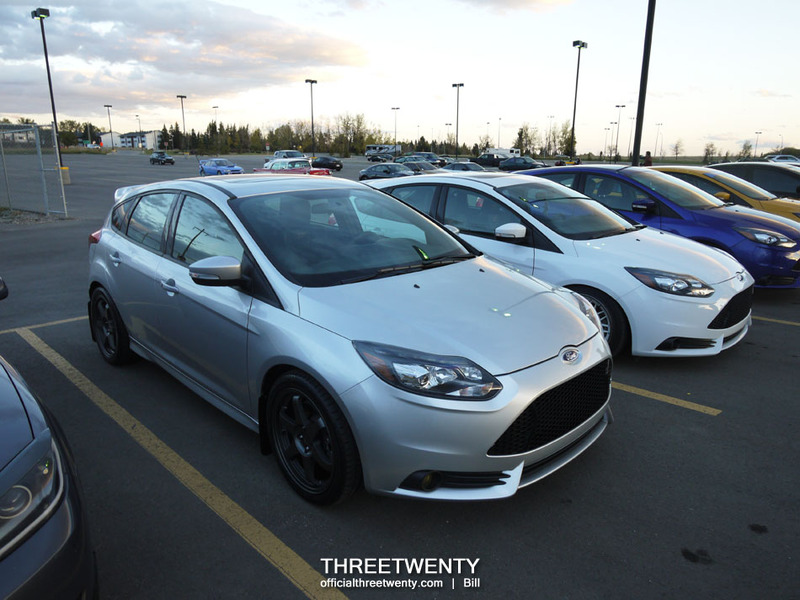 I have only ever seen one other silver ST in person, but the only difference was the wheels and it was a while ago so it could even be the same one. Who knows? 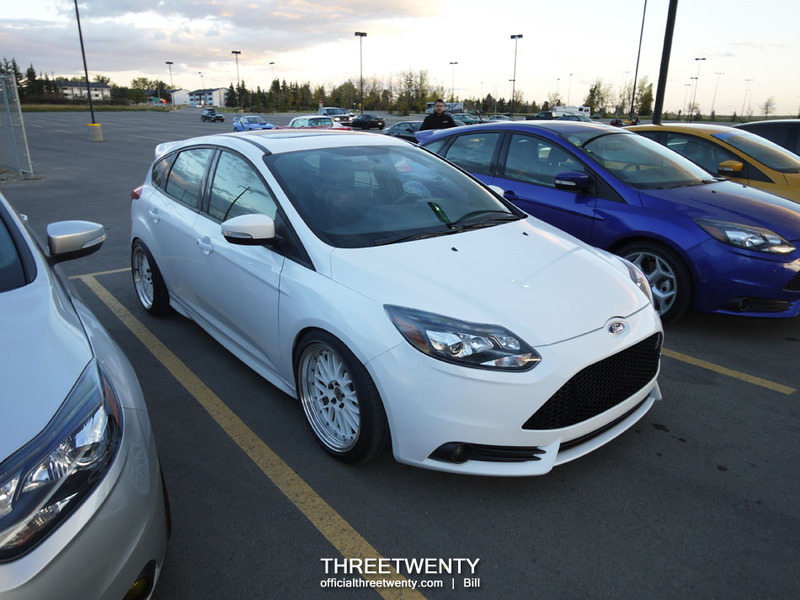 Brandon, a regular at the GE meets, had his white ST. Keeping with the condiment nicknames for some of the cars we’ve dubbed this one (and Vlad’s) Mayo. 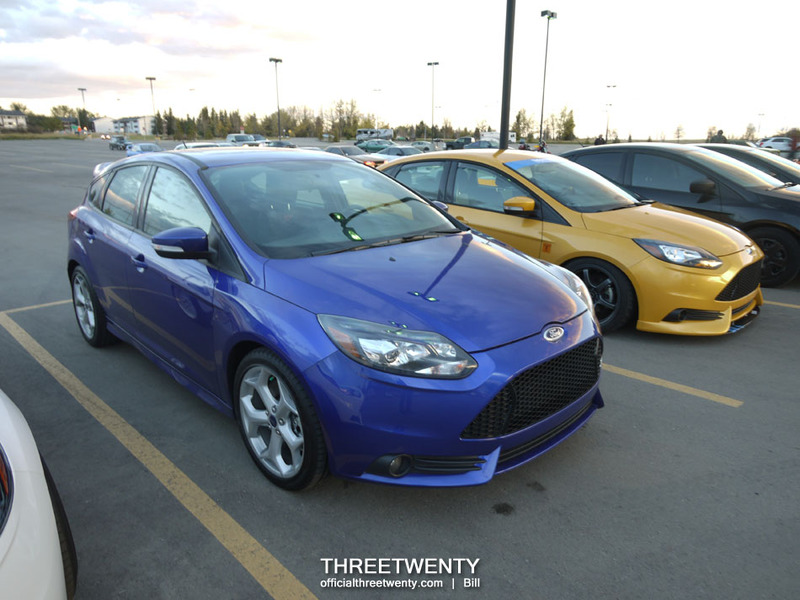 Ryan arrived with his brand new Performance Blue ST – and I really do mean brand new. It was just a few days old at this time. After Tangerine Scream this is my favourite colour for the 13/14 STs. Speaking of which, unfortunately no Tangerine Screams could show up but obviously mine was there, so we at least had a yellow car present. The one we were really missing was red as unfortunately no Race Red STs were available on this night. Some day we’ll get all 6 colours together! Carrying on, next was Dominic’s S which was sporting some new parts since the first time I saw it earlier this season. The S is only available as a sedan so mine wasn’t the only one present. 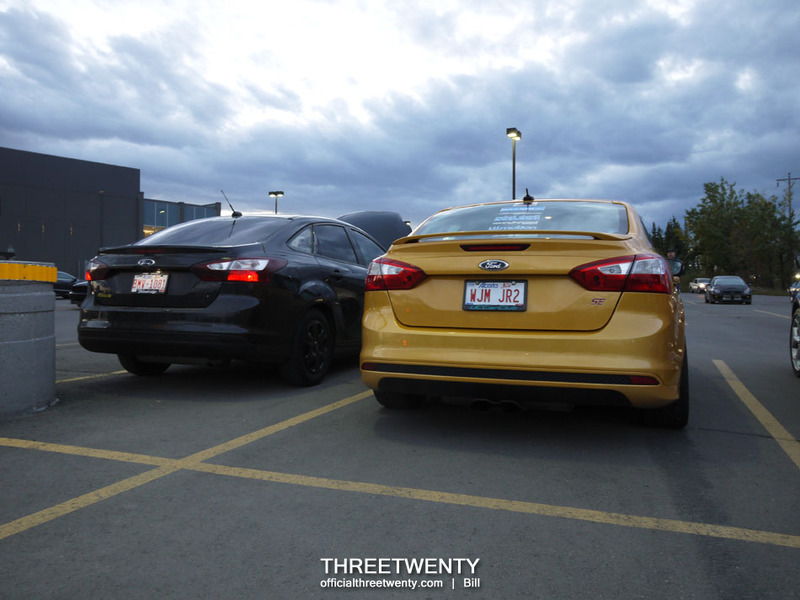 In case you’re wondering, it and the ST next to it are the same colour; Tuxedo Black. Nearly all the Mk3s I see here are 5-doors so to park beside another sedan is quite uncommon. 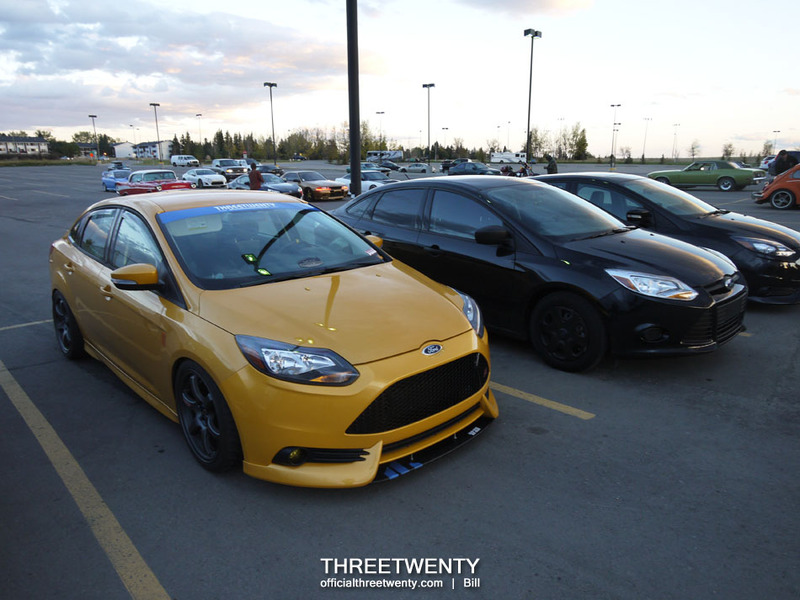 Black and yellow black and yellow….. 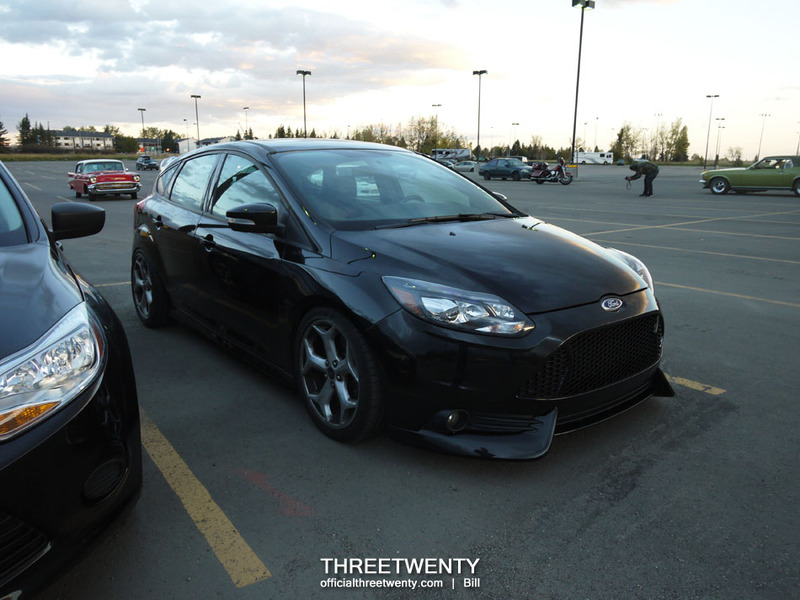 Finally we have Laurier’s ST, lowered with spaced stock wheels and some 1552 Cup Spoilers. I honestly am not the biggest fan of Cup Spoilers by themselves (which is why mine has the E Glove splitter, to fill in the gap between them) but on a black car I think they work rather well. Also, check out the rear fitment – perfect. Essentially just the stance was changed and the front bumper’s design exaggerated, yet it looks so much meaner than stock. With how few cars there were in the lot during our meet I decided to leave my camera at home the following week thinking that it would be another tiny gathering, but we actually had a very good turnout! Provided the weather is nice we’ll be back this week so head on over if you can!